Bio: I was diagnosed with juvenile rheumatoid arthritis when I was 4 years old. At 12 I lost the abilty to walk and stand. I began writing as a way to cope with the disease, pain, acceptance and depression. Over the years I've been published many places and last year I released my first book of poetry, Requiem. I have also created cover art for a couple chap books by other writers. 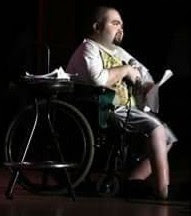 Just recently I finished a manuscript for a collection of poems about my history with the disease and the mental, physical and social aspects of life with a disability. and develop a better way to live. A better way to understand. We want to be heard. We wish to speak as equals. We are people with hopes and dreams. as more than a disability. Four worn out wheels and a beaten up padded chair. A set of broken brakes and a pair of useless legs. very few, if any, will come to fruition. as his independence is slowly stripped away. doors and stairs block him from his destination. People are constantly staring at him. They stay away as if he’s contagious. he was on trial for the crime of being different. that need to be asked. If they did things would be different. But they don’t and things aren’t. like an outcast from the rest of society. The man has many fears. his eyes close or the lights go out. He will never find that special person. Someone who will look past the outside. Someone who will love during the good and the bad. He will never get married. the same pain and torture? then he will never have children of his own. All that this man can do is dream and write. and push his fears aside. and beaten up padded chair. to be stripped for parts. that the inevitable will happen. "It'll be your time when it is meant to be"
unable to tell me what the "time" is. yet never wanting it to happen. These days are blending before my eyes. blurring the ever present times. one unholy dream to be normal. and live what shouldn't be. the life I should have lived. and when I’ve been truly alive. Everyday is the same and I just exist. and only win when I fail. always preaching of someday living. It's hard to explain my pain. but pain is something extremely personal. It's different for each of us. It's a story only the writer will have experienced. and give their own interpretation. but none will be exactly right. and grinding like sandpaper on raw wood. trying hard to pierce it. It is everywhere yet no where I can point to. feeds my bones like a synthetic drug. It does more harm than good. and one I never want to live without. In the past I did what I could to rid myself of it. But pain is like life, it's eternal. almost as long as I have lived. and given me a reason to be. and the passion of art. It has helped me to be me, the real me. It has helped me to truly live.